Can We Still Slip the Surly Bonds of Earth? This week we saw an ironic juxtaposition of events dealing with outer space and our attitudes toward it. 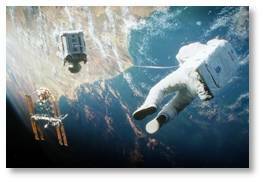 The first is the great success of the movie Gravity, which opened last week at the top of the charts, setting a box-office record for the month of October. It has grossed $73,788,739 to date with another big weekend coming up. Amazingly, 80% of that income came from 3D sales. This shows that people not only want to see the movie, they want to experience what it feels like to be in space. 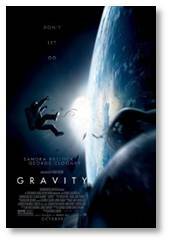 @Gravity_movie has a 97% Fresh score on the Rotten Tomatoes Tomatometer and 90% of nearly 75,000 viewers liked it. We’re going to see it tonight in IMAX 3D, which is as close as I will ever come to breaking through the edge of the envelope and experiencing the wonder of being in outer space. My review will follow. The second event is the death of Astronaut M. Scott Carpenter. 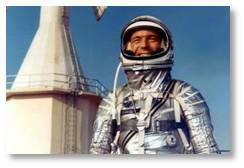 As one of the original Mercury Seven astronauts, he was the fourth American in space and the second one in orbit. In April of 1961—the fourth month—he circled the Earth three times with a flight time of four hours and 54 minutes. It’s hard for those of us who remember those flights to convey their importance to a generation that seems to have turned inward. Back then the whole country stopped to watch the launches, our hearts in our mouths, but filled with pride and hope. Black-and-white TVs everywhere tuned in to Cape Canaveral as the count-down went on with its technical language and uninflected tone. We counted on @NASA to know what they were doing and we knew a man’s life was at stake. We held our breaths as the rocket rose into the sky and disappeared. The NASA Space program was the result of what President John F. Kennedy called the “space race.” The Union of Soviet Socialist Republics, our deadly enemy, had already put a cosmonaut in orbit and we lagged sadly behind. While Presidential Candidate Kennedy was accused of using the space race as a campaign tool, it is certainly true that the world we live in now is a very different place than it would have been had President Kennedy not set a goal of overtaking Russia and going to the moon. Sure, we wouldn’t have Velcro, memory foam, freeze-dried foods and cochlear implants among the thousands of products spun off from NASA research. We would also lack many other important things that we now take for granted. Imagine, for example, a world in which America never put up satellites because the USSR owned orbital space. We would not today have satellites that provide wireless and internet communications, a global positioning system for maps and directions, satellites for weather tracking and temperature monitoring. There would be no Hubble Space Telescope to give us an unobstructed view into the universe. There would be no International Space Station for scientific discovery. There would have been no shuttle missions. Had the Soviet Union controlled space, they could have populated it with armed satellites and none of the development we now take for granted would have happened. Today, in the 21st century, my generation hoped would see an established moon base and astronauts traveling to Mars. We have instead retreated from space. The budget sequestration has gutted NASA. Cape Kennedy is virtually a museum and the Houston launch facilities have laid off thousands. In a great irony, America now sends astronauts into space on Russian rockets. To my generation, the idea of trusting American lives to Russian technology is both frightening and disgusting. American technology is and always has been superior in every way. We have lost our pride, our ambition, and our great vision. Worse, we have lost our way. It makes me want to weep. We have sacrificed all this on the altar of a smaller government and tax breaks for the mega-rich. A government so small “you can strangle it in a bathtub” does not send astronauts to the moon, to Mars, or outside the solar system. It does not look up or think big. It does not take risks or accomplish great things. Yet America was settled and founded by people willing to do exactly that. We are now more tied by the surly bonds of Earth that we have been since Lt. Commander Scott Carpenter orbited Earth 52 years ago. We have politicians who think small and encourage the American people to turn against one another and be less, far less, than we can be. But that doesn’t mean we like it. The people flocking to see Gravity are going because they want to see more than a good movie. They want to feel again that sense of pride and glory in a country that can do such wonderful things. They want to be Out There, to look down and see Earth hanging in space, to touch the face of God. If only. If only we could.